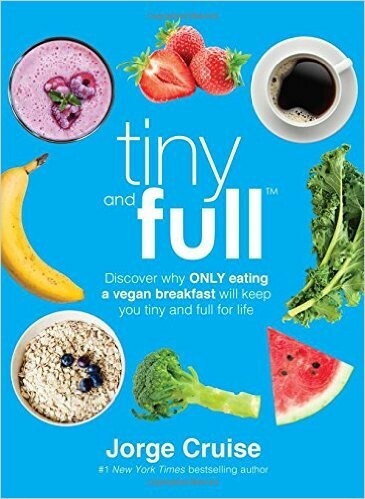 Celebrity trainer Jorge Cruise‘s new book Tiny and Full will be released just in time for the holidays and promises you a smaller waist by only changing one meal a day. The premise is simple: follow a vegan diet for breakfast. Then, go back to incorporating animal-based foods for lunch and dinner, while still keeping a heavy emphasis on plant-based foods. Why just breakfast? you may be asking. There are two main reasons. “There are numerous studies showing that determination and drive are almost always strongest in the morning hours when you are fresh,” explains Cruise. “This is because willpower is like a muscle — it’s strongest when it has been given good rest and restoration.” Focusing on breakfast, when your resolve is highest, gives you the best odds for success. Just one meal is all it takes, though. Cruise makes it clear he is not an advocate for becoming a full time vegan. The negatives, in addition to being hard to sustain, are that a vegan diet is missing crucial nutrients for optimal health and wellness. Because going vegan makes it easy to become deficient in Vitamin B12, Vitamin D, Iron, Zinc, Calcium, and Omega 3s, many vegans go without or must turn to expensive supplements to achieve proper nutrition. “However, by just being a vegan for breakfast but then adding in animal-based foods for lunch and dinner, you are not only creating a sustainable lifestyle that you can stick to, but you are ensuring a balanced diet with the proper nutrients,” says Cruise. Jorge Cruise’s Tiny and Full is available December 29th at book stores and online everywhere. But you don’t have to wait until then to make the switch to vegan breakfasts. Try one of Cruise’s favorite high protein vegan breakfast recipes exclusively from Tiny and Full and get a jump start on your New Years weight loss resolution! In a large bowl, whisk together the almond milk, chia seeds and maple syrup. Let sit for 5-10 minutes. Whisk again. Cover and place in the fridge for 2.5-3hours. You can also let it chill overnight. Stir mixture occasionally. Remove for fridge and stir. Mix in blueberries and chopped mango.